Armas Huutamo started their courier in 1997 as a two man acoustic punk buskers. 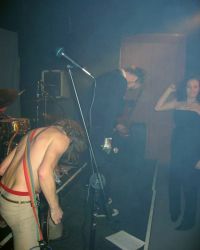 Back then the name of the band was Armas Kapsu & Mäyrikset and the performances were 100% improvised. Soon enough it was unavoidable for the act to go electric and on stage, but this wasn't a trouble-free step at all - their first electric gig was cancelled by the event organizers only after three songs. In 90's the-act-to-be-Armas-Huutamo released two cassettes and two CD records. During the next decade the band grew to be a line-up of four members and eight eyes, did re-invent itself and released a debut record under the new name in 2006.